Sydney Park Glams Up For ‘Walking Dead’s Premiere Party | Alexa Nisenson, Callan McAuliffe, Sydney Park | Just Jared Jr.
Sydney Park adds a pop of color with her neon yellow heels while arriving for The Walking Dead Premiere and After Party held at at the DGA Theater on Thursday night (September 27) in Los Angeles. The 20-year-old actress, who you’ll be seeing a lot of in The Perfectionists, was joined by co-stars Alexa Nisenson and Callan McAuliffe. If you don’t know, Sydney plays Cyndie and Callan plays Alden in the series, with Alexa starring as Charlie in Fear The Walking Dead. FYI: Alexa wore a DMN Demain Paris top and pants with Schutz heels, and Le Vain, and vintage jewelry, and a Prada bag. Happy Australia Day! These Are Some of JJJ's All-Time Favorite Aussies! Gina Rodriguez's My Hero Episode Is Out Today! 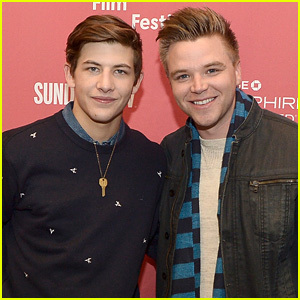 Zoe Levin & Callan McAuliffe: 'Beneath the Harvest Sky' Premiere at Tribeca 2014! Callan McAuliffe, Emory Cohen & Zoe Levin: Tribeca 2014 Portraits!